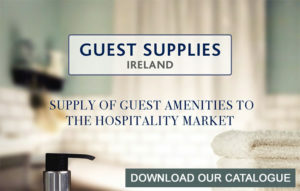 Guest Supplies Ireland is a business dedicated to the supply of guest amenities to the hospitality market and individuals in Ireland. We operate from our warehouse in Clare and offer delivery throughout Ireland on our product ranges. Operating an on line and telephone ordering service we pride ourselves on our customer care. We have a team of experienced staff on hand to discuss your requirements and how we can best help you with your guest supplies.